Smart lighting is an integral part of a smart home setup, even the most basic one. And thanks to the easy availability and affordability of smart speakers like Amazon Echo and Google Home in the country, more and more folks are getting on to the smart home bandwagon, exploring options on how to smarten up their abodes. This then, seems an opportune time for Yeelight to make its foray into India. Yeelight, in case you didn’t know, is a Xiaomi ecosystem company based out of China, and makes smart lights and lamps. 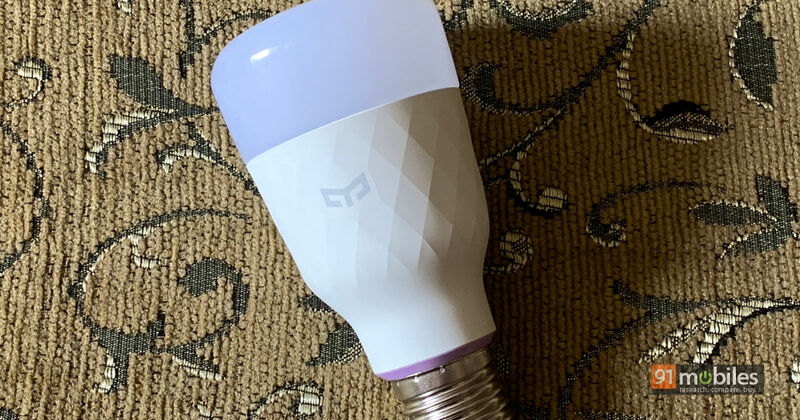 One of its debut products in India includes the generically-named Smart LED Bulb (Color), and that’s exactly what I’ll be talking about here. 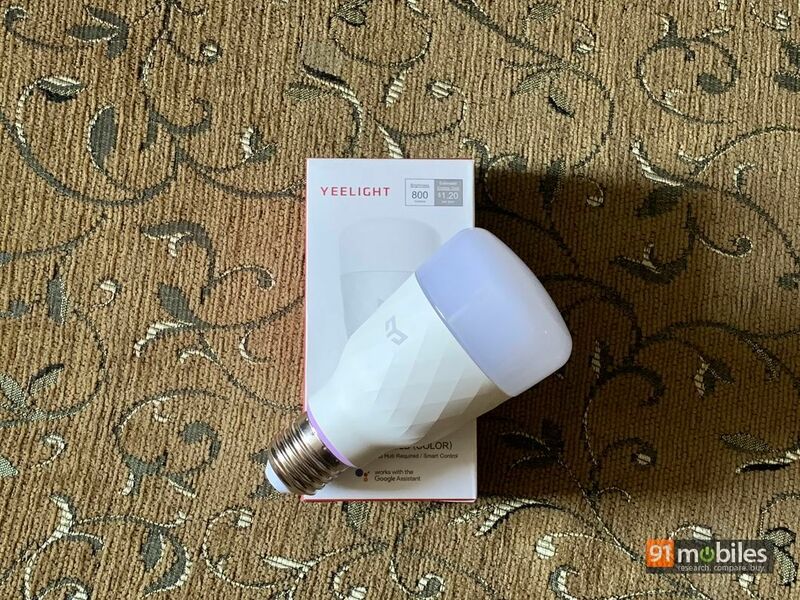 Yeelight’s smart bulb goes head to head with similar options from Philips Hue, which is possibly the most popularly known smart lighting solution. You should know that while Philips Hue uses Zigbee (which is a communications standard used by IoT devices) and therefore requires a dedicated hub to connect to your home Wi-Fi, the Yeelight Smart LED Bulb features built in Wi-Fi and doesn’t need any hub. So it doesn’t need a hub to work, and that is one of if its key benefits. The 10W bulb is rated at 25,000 hours in terms of life expectancy, so should last you a fair bit. 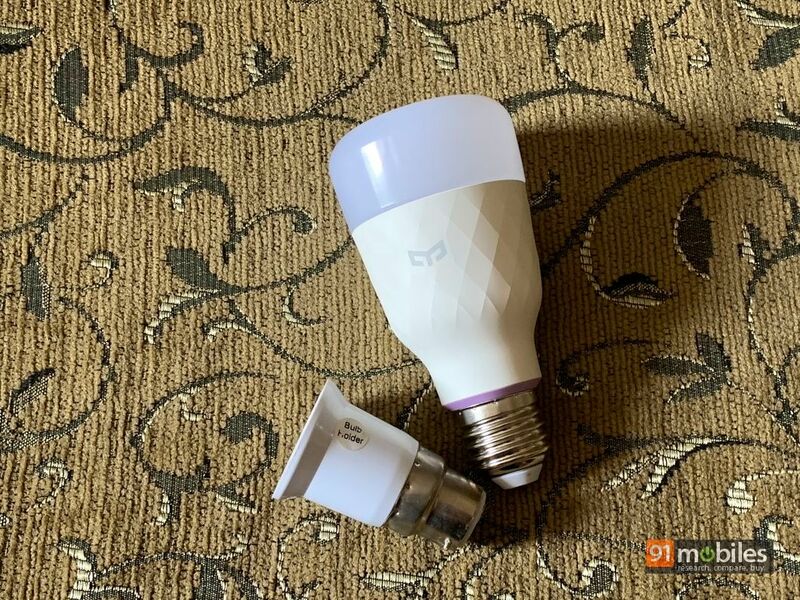 You should also note however, that the Yeelight Smart LED Bulb comes with an E27 base (one that looks like a thick large screw), which means that while it may fit into some lamps or sockets, you’ll need an adapter to install the bulb into the more commonly found B22 bulb sockets. Thankfully, E27 to B22 adapters are nominally priced and are quite easily available online. Setting up the Yeelight Smart LED bulb is easy – just plug it into a socket, power it up, and use the Yeelight app (available on both Android as well as iOS) to hook it up to your home Wi-Fi. You’ll need to create a new account or login into your existing one, and add the new bulb to your setup. The app will guide you through the process, which mainly involves specifying your home Wi-Fi details, entering its password, and connecting you phone to the temporary Wi-Fi hotspot created by the bulb the first time it’s powered up. And once the bulb has hooked up to your home network, you’re all set to experience the magic of smart lighting. After the bulb is set up and connected to your home Wi-Fi, you can use the app on the phone to control it – switch it on or off, control brightness, and change colours. The app also allows you to set up schedules and timers. You can use the app to set up custom scenes, and even put the bulb into ‘Flow’ mode which switches between various colours at the specified speed and brightness. Then there’s a ‘Music Flow’ mode that use your phone’s microphone to listen and sync the bulb with music playing nearby. 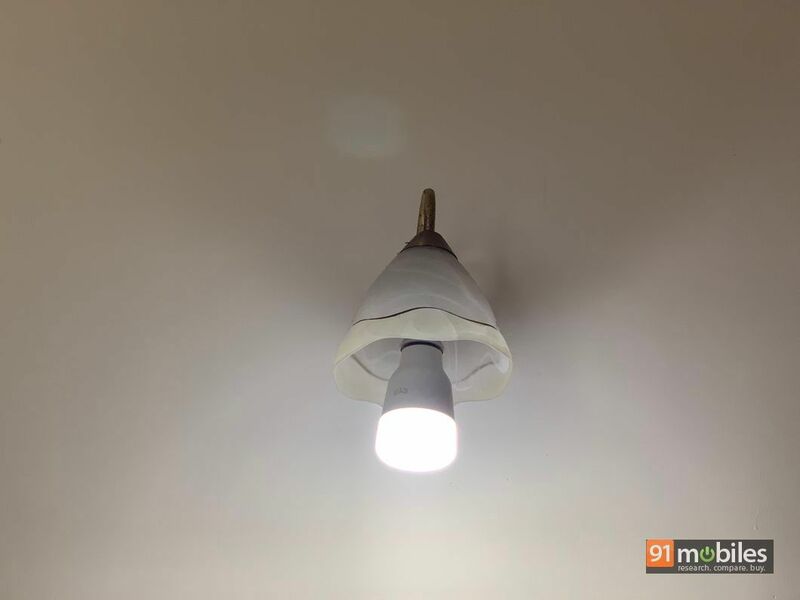 Moreover, if you have multiple Yeelight Smart LED Bulbs, you can control them all together using the app, and set up ‘rooms’ that let you control different sets of bulbs separately. That’s not even the half of it though. Thanks to support for Amazon Alexa and Google Assistant, you can control the bulb using just your voice though. If you have an Amazon Echo device for example, you can enable the Yeelight skill to link your account to Alexa, and then use the power of voice to toggle the bulb on or off, set brightness, and switch colours. And then there’s support for IFTTT. Short for ‘If this then that’, IFTTT is a free online platform that lets you sync up and connect various smart devices and online services, giving you the ability to use the full power of IoT. Just to give you en example, you could use IFTTT to link your Android phone and the Yeelight Smart LED Bulb such that the latter can blink each time you miss a call on your smartphone. 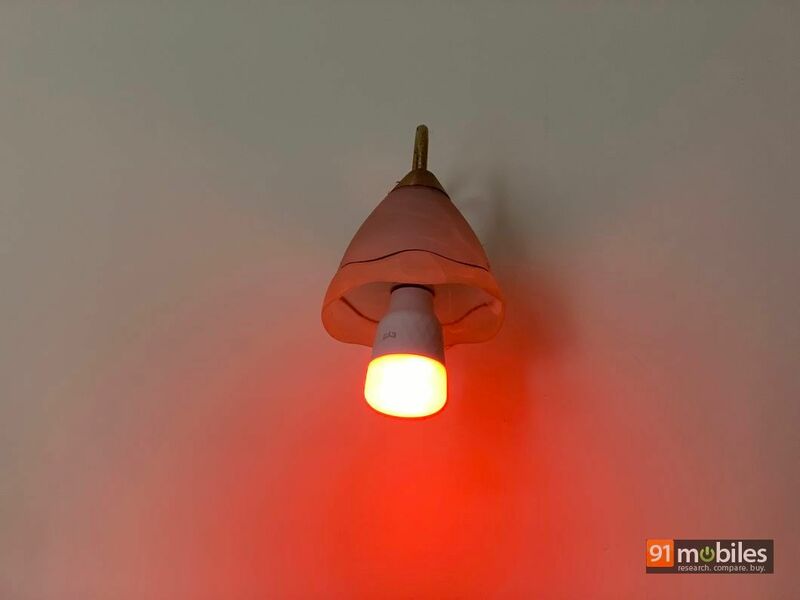 Imagine the bulb lighting up automatically when you enter the house, or brightening up slowly to full brightness in warm, soothing colours to wake you up gently. That’s the power of IFTTT combined with the Yeelight Smart LED Bulb for you. You need a free account on IFTTT (accessible via a browser or its own app), and then use one of IFTTT’s readymade applets for Yeelight. Tthere are tons of those… all you need to do is find the ones you want to use and enable them. 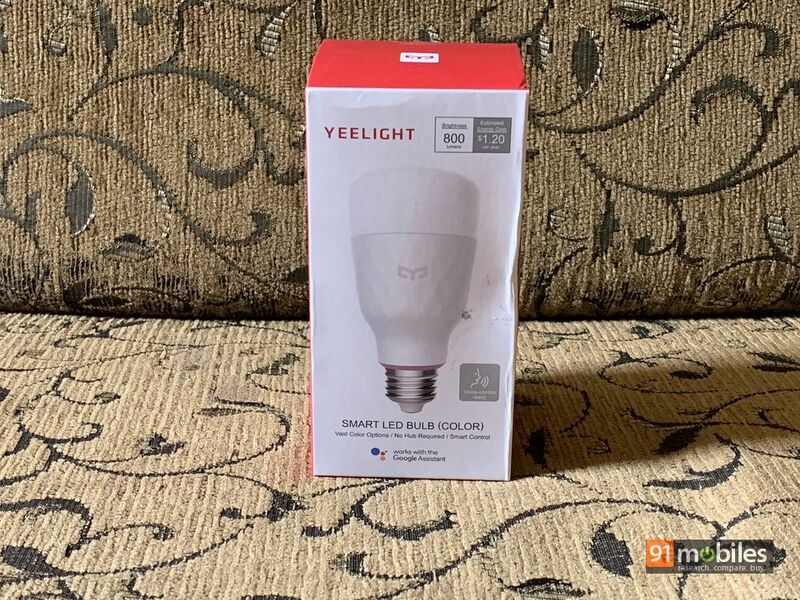 Priced at Rs 2,799, the Yeelight Smart LED Bulb doesn’t come cheap though. While it’s definitely more affordable than opting for a Philips Hue setup, there are some other smart bulbs from the likes of Syska, TP-Link and others that offer similar functionality as the Yeelight Smart LED Bulb. Yeelight;s option may not really be an eyes-closed sort of a purchase, but you should know that it’s quite capable, feature rich and works quite well. Clearly, if you’re exploring the idea of setting up a smart home, the Yeelight Smart LED Bulb deserves a long, hard look.